Buhari administration has faced many obstacles but many of it has been due to the dust it met before the grand takeover. In 2017, the federal government has said it would close down the land border between Nigeria and some neighboring country in a few days time to avoid the smuggling of foreign rice. Buhari has declared that Nigeria was capable of feeding herself and also could open up to investors by improving on exports. It's not new knowledge that Nigeria relied solely on Crude oil and it is such a shame that Nigeria has not been able to leverage on other resources particularly agriculture. The minister of Agriculture and Rural Development had explained that the closure of the borders was necessary to frustrate their attempt of destroying Nigeria’s plan to stop local production. They are bent on making money of our economy while they watch us go down by the day. Though the name of the country was withheld, this measure is in a bid for Nigerian to explore the option of local production of rice by our Youths. Dr. Ogbeh is one of the first Nigerians to mill rice free of stones, he reiterated that the rice imported to Nigeria is poisonous and causes cancer. He said, ‘if you go to South East Asia where they grow rice, if you plant rice in the same place for four to six years continuously, the quantum of arsenic begins to increase and arsenic causes cancer. The smuggling activities pose a serious threat to the nation’s economy has also become an impediment to all rice production projects. The current national demand for rice is between 6- 7 million tons out of which about 3.2 million tones are produced locally. But with shiploads of far cheaper loads of rice smuggled into Nigeria through seme border and several other routes, the local producers cannot compete and behave become discouraged. The problem is most Nigerian are lazy and expect the government to put food on their table. Dr. Ogbehemphasizedd that the government can only lead her citizens to prosperity not create magic. He said that the number of rice farmers under President Buhari’s regime has increased from 5 million to 30 million. 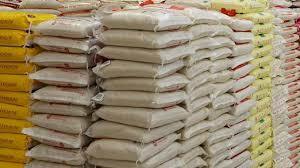 States like Anambra, Kebbi, Kano, Jigawa, Ebonyi are doing excellently well in rice production. All round, Nigeria has been considered a dumping ground for countries with large industries and this has largely been successful because they is no active enforcer of standardization. However, the goal is to ensure self sufficiency and save scare foreign exchange. President Buhari has been able to concentrate the attention of the world bank to improve water availability for all farming seasons in Jigawa state with the 9.6 billion naira allocation. Several of such projects are ongoing around the country so as the boost the agricultural sector as a whole. This would encourage our farmers to produce more. Nice! Kudo to Buhari's government.